Erwin Austin's illustration from Things That Go Bump in the Night . The morning sun shines on the damp, impossibly green grass—thick and bright as graveyard grass. My grandfather and I share the deep shade of a seventeenth-century house called Pomeroy Place. Our ladder-back chairs wobble on the uneven patio. Cold radiates from the slate at our feet. We sit close enough to brush elbows. We are each playing our own silent game of solitaire. The morning is quiet, except for the shuffling of our decks, the trill of birdsong, and the shuuushing of traffic on Main Street just beyond the hedgerows. I am ten years old, and even then I'm delighted at the irony of playing cards alone but together with the man we called Papa. I have my grandfather all to myself. Every summer, my family makes the pilgrimage from our home in south Florida to Cooperstown, the village in upstate New York where my parents grew up. In Cooperstown, no one is ever really alone. The village is known for its literary past, rich history, and abundance of ghosts. My grandfather was a folklorist. He helped found two museums in Cooperstown, traveled the country collecting folk art, and most importantly—at least, in terms of how I came to view the world—he and his students collected folk tales, with an emphasis on ghost stories. One of his books, Things That Go Bump in the Night , gathers many of them. The ghosts in the book and my memories of my grandfather's stories shaped my world. So did Cooperstown. In the book's 1958 preface, my grandfather wrote, "It is a great privilege to live in a town which the dead have not deserted. Walk the streets of Cooperstown with me on a moonlit night, and I'll show you a village where the enchantment of death is a warm and friendly quality." By the time I came along, my grandfather needed a cane. He stopped often to rest. We strolled the streets of Cooperstown and stopped to buy cigars or The New York Times . Sometimes, we ventured down to the bench beside Lake Otsego. Mostly, Papa and I would hang around Pomeroy Place and travel on the spoken word. Even as a child, I was aware that Pomeroy Place had some connection to two prominent local families, the Pomeroys and the Coopers. 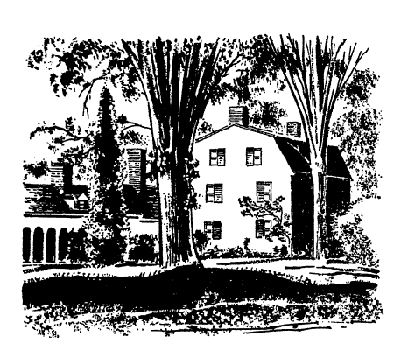 Judge William Cooper, who bought the land that would become the village of Cooperstown in 1775, commissioned Pomeroy Place in 1804 for his daughter, Ann, and her new husband, George Pomeroy. The Cooper line includes the naturalist writer Susan Fenimore Cooper, who wrote Rural Hours , and novelist James Fenimore Cooper, who gave us The Leatherstocking Tales and the template for the Great American Hero, Hawkeye, from The Last of the Mohicans . Cooperstown breathes with a strange and wondrous quality. It lives in the spaces between the past and present, fact and fantasy, memory and imagination. When I interviewed the novelist, poet, and Cooperstown resident Marly Youmans for Clarkesworld Magazine a few years ago, she said, "Cooperstown is a border town settled somewhere between ordinary life and fiction. People regard places brought into novels and named by James Fenimore Cooper as major landmarks. They borrow his place names for shops, clubs and nonprofit organizations. . . . Cooperstown is America's mythic site of the birth of baseball. It also has a kind of class structure that smacks of Henry James and Europe." This is where my parents grew up, my grandparents lived, and where I still visit, the place I think of as my ancestral home. And being in Cooperstown, next to my grandfather, playing cards spread out before us, I felt as though I was but a character in a fantastical story. He was the man who wrote the story and told the tales, who created my world and filled it with wonder. We sit in silence. The birds have quieted down. The cards are still set out before us in rows and stacks for the umpteenth game of solitaire. The sun eases along above us. The light brightens with each minute and hour. The morning's coolness has lost its edge. There is nowhere else in the world that I would rather be. No one I'd rather be with. Sharing silence with a person you love and admire feels like prayer. We Joneses are not churchgoing folk, yet moments alone with my father or grandfather often felt like worship—not worship of them or of each other, but worship of something far greater, a feeling of wholeness, of oneness. When Papa finally speaks, his voice is rich and full and as familiar as a recurring dream. He smells of cigars, coffee, and something like wool or laundry starch. Later in the day there will be a hint of rum. The stories Papa tells to me are deeply familiar, but still vibrant and fresh. He has told them many times, to audiences, to students, to his family, to me. He has told them on the radio and on television, told them around the country, around the world. But right now Papa is with me, telling me these stories. They are his and mine. They are ours. They are always different, but always the same. Details change, but the truth remains. This is how storytelling works, how memory works. How life works. Papa tells me about Ann Cooper Pomeroy's ghost giving directions to an Episcopal priest; about a dead wife pestering her husband's new bride; about a haunted leather chair; and the most compelling story of all, about an Indian buried beneath a stone wall. The sun ascends toward noon and the shadow of Pomeroy Place retreats. I stand and stretch, keeping a discreet eye on Papa as he uses his cane to rise from his chair. I know, perhaps instinctively or perhaps by my father's example, that I should not offer to help him stand or walk. I am to be alert and ready to help if his balance fails him, but not overly solicitous. It has to do with age and pride and dignity. Papa disappears into the unusually small kitchen, which is just to the left of the back door. My grandmother makes sandwiches—butter and peanut butter on thin white bread. Footfalls and the warbled recording of a performance from the Metropolitan Opera vibrate the china cups and saucers in the cupboards and rattle panes of glass. I linger in the hallway. Ghosts haunt Pomeroy Place, too. But they are different from the ones roaming the streets of Cooperstown. These ghosts inside the house sing with the gloriously otherworldly voices of opera singers rehearsing in the basement. Their songs rise up through the floor, pure energy, pure flowing power. I can feel it in my feet, in my bones, up and down my spine. My grandparents helped found the Glimmerglass Opera Company, which started in the Cooperstown High School gymnasium in the summer of 1975. Grandma Aggie had been something of an opera singer before marrying her first husband, and with the shared enthusiasm of her second husband, my grandfather, she jumped headfirst into the burgeoning summer-stock company that would, within a decade, develop an international reputation. So committed, so immersed in the opera was my grandmother that she often let the sopranos live in her basement. All summer long, day and night, it seemed, these sopranos ran scales and otherwise haunted the house with vocal exercises and fragments of arias that often clashed with the tinny recordings of the Met my grandmother played while fussing about the house. 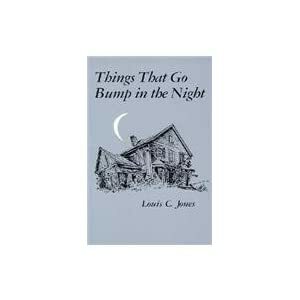 Things That Go Bump in the Night , by Louis C. Jones. Things that Go Bump in the Night was not Papa's only book, but it was certainly the most important in his professional life and, in some ways, his family life. He wrote the manuscript in the '50s, based on his students' field work; he had sent them out to "discover their own personal heritage" in the hills and on the farms of upstate New York. They had gathered hundreds of stories, many of them ghost stories. These are, he wrote, "the stories of ghosts kept alive by the telling and retelling of our people. This is not a scientist's report on psychic phenomena, it's not a handbook for scaring children at summer camps, it is not history; it is folklore as it was found in New York State" in the 1940s and early '50s. I am sometimes asked what those who think they have seen ghosts have really seen. I cannot answer that with any great assurance; I can only recite an experience which helped my understanding tremendously. It happened at a time when I was not unusually interested in this type of folklore, and it is the only experience of its kind I have ever had. I was not then, as I am not now, convinced that those who die come back to Earth in a sensible form, nor was my actual experience unusual at all; it has happened millions of times to others. I recount it merely because I can make this report from first hand and without any question in my own mind as to the validity of the details. In his later years my father was a devoted gardener; March to November he spent from dawn to dusk among his flowers. His knowledge of botany and floriculture was wide and based on scientific study, which he had been carrying on as an avocation for fifty years. During the last ten years of his life I would drop in on him once or twice a week, and there was a good chance that I would find him on his knees among his flowers or in the barn working over his records or preparing plants or seeds for the ground. He died in Albany in January, 1941, and in March I persuaded John Witthoft, then one of my students and today Chief Curator of Anthropology at the Pennsylvania State Museum, to take over the care of the garden for my stepmother. On one of those March days when the air has the softness of spring in it but the ground is still covered with snow, John and I went out to the barn to look the situation over, to see what plans had been left, what experiments were under way, what fertilizer and seeds we would need. This was a typical city barn, divided in two rooms, one a single horse stall and the other what had been a carriage room. It was a place where I had played all through my boyhood; it was always a place closely associated with my father. We entered the small door in front of the horse stall, and I went through into the dark, big carriage room to roll back the sliding door, so we could see what was there. As the door rolled back the room was lighted by the brilliant morning sun reflected from the snow. When I turned to look at the room, my father was sitting on a crate cutting peony roots. 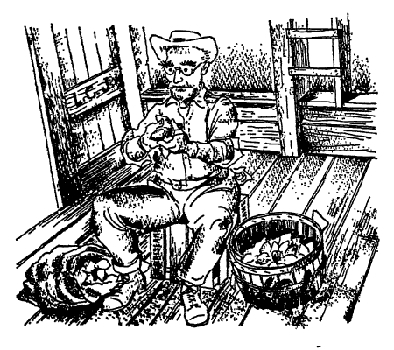 He wore his old work clothes, a faded shirt, and dirty pants; his ancient straw hat was stuck on the back of his head. Beads of sweat covered his brow and his shirt was dark under the arms. He kept right on working. He looked up at me, his beard white and gleaming, but his pale blue eyes were more cold and expressionless than I had ever seen them. There was neither pleasure nor anger in his face it was merely that he was looking straight at me. And then presently he wasn't there. John had seen nothing but an upturned crate. Being a product of the twentieth century I had an explanation. In a room redolent with memories of my recently dead father, I projected from my mind his image. Emotion, fatigue, recollection, all contributed toward the vision. This was a psychological experience and not a very unusual one at that. With my training and attitudes, that is all that it could have been, but suppose I were not a product of this age but of an earlier and more believing one? Suppose I had been raised in a climate of opinion which assumed as a matter of course that for any one of a million reasons or for no reason at all the dead come back. Suppose members of my family, the leaders of my church and community had told me of these visits from the dead as true experiences; suppose the neighborhood in which I lived contained houses from which everyone shied away because they were haunted. . . . What then would I have seen? Then it would have been no projection from my unconscious mind, but my father's ghost, pure and simple. Not only that, but it would have been perfectly understandable, under those circumstances, for the meeting to have been far more fruitful. He might then have spoken to me, given me messages, warnings, advice which, under the circumstances, would have had tremendous meaning for me. Did my grandfather believe in ghosts? Did I believe in ghosts? I didn't know at ten and I don't know now . . . not for sure. In some ways, I wonder if the question even needs to be asked. "When I turned to look at the room, my father was sitting on a crate cutting peony roots." Erwin Austin's illustration from Things That Go Bump in the Night . When I was thirteen, a package came to our home in Florida from my grandfather, containing a copy of the new edition of Bump . In "Preface to the New Edition," Papa addressed the question he had been asked so many times since the book's original release. "This volume was not designed to persuade anyone of anything, but rather to report what the people said about the dead they believed returned," Papa writes. "I was not, am not, a believer in the supernatural; if I had had a motto it would probably have been, Dubito Ergo Sum." As I had appreciated the irony of playing solitaire together, now I appreciate the ambivalence of his words. I am not a believer. I am a doubter. I also see sleight of hand, evasiveness, and mischief—all the traits of a master storyteller. And I love it. We are at some sort of gathering—friends, family, students, writers, artists, and museum-world luminaries. We all mill about in the smoke and yellow light, drinking, chatting, laughing. I am a teenager. I have never seen a ghost inside Pomeroy Place—only my grandparents' dog, Fido the Sheltie, has seen a ghost in the house, even though I've heard hundreds of stories about them here. My Aunt Beebe, who was a student of my grandfather's, takes me by the arm and asks, "Have you seen the ghost at the bridge?" Out in front of Pomeroy Place, we stand in the middle of Main Street out of the streetlamps' reach. The village is cool and quiet at night. There's no traffic. Aunt Beebe checks her watch, points to the bridge that spans the mouth of the Susquehanna River, and says, "It's almost time." "Wait." We smoke a few cigarettes, sip our drinks, whisper about this or that, something gossipy, some juicy tidbit that makes us laugh. A bluish light—the color of glowing milk—a silhouette of a man, rises from under the bridge, crosses the road, and disappears beneath the other side of the bridge. It happens in a single breath. It happens the way dreams do; it's over before I realize it has even happened. "Did you see him?" I nod. "Who was he?" Aunt Beebe shares two stories with me. He's a soldier, who either left his post to see the woman he loved, allowing enemy soldiers to take the river head and infiltrate the village, or who held his post while the woman he loved, paddling across the lake to see him, drowned before reaching him at the bridge. Either he chose duty over love or love over duty. Either way, he still returns. Only he doesn't return in historical records or anyone else's stories. Strangely, I've never found a record or retelling of this tale anywhere. It never dawned on me to doubt my grandfather's stories. Never occurred to me to blurt out, "That couldn't happen!" or "No way!" or "You're making that up!" I embraced them. They are real, even if the events depicted in them might not be. Do I believe them? These stories? I believe in the power of stories, the truth of stories, and the basic human need for stories. I believe that stories are the culmination of human ambivalence, of doubt. I believe that we are, all of us, stories. Whenever the grass is impossibly green—the sort of vibrant, healthy green only decay can provide—I believe. When I sit down to play solitaire, to chat with friends or at a computer keyboard to write, I believe in stories. With all my heart, I believe. It's where I come from and it's who I am. It's who we all are. Dubito ergo sum.